Marcelo Rocha (producer, arranger and woodwind) Marcelo has studied Brazilian sounds, styles such as bossa nova, samba, MPB, as well as jazz, funk and gospel for over 25 years. 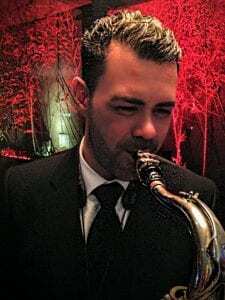 His saxophone and clarinet has illustrated hundreds of songs on albums by artists such as Beth Carvalho, Leo Jaime, Nei Lopes, Banda Gerd, Skank, Berimbrown, Quintet in White and Black, Jota Quest, Alcyone, Pixote, Jambul, Zeze de Camargo & Luciano, Netinho Paula, Roberto Menescal, Vanessa Falabella and Nelson Faria. Miner Itabira, Marcelo moved with his family to Belo Horizonte where he started playing various musical instruments to 6 years old. When he was 15, his grandfather gave him his first clarinet and in less than a year was already playing professionally in local bars and clubs. In 2006 he moved to São Paulo, where he has been performing in various shows, as a musician, arranger and producer. Marcelo has acquired notoriety as arranger and producer in recent years, and has its present work in more than a thousand registered recordings, currently completing 20 years of career as a musician, arranger and producer, and has its present work in more than a thousand registered recordings, currently completing 20 years of career. Marcelo’s latest release is titled “Embalada” by Marcelo Freitas & Zimbo Trio. This recording documents a sensitive and creative musician on the first solo release of his 24-year career. The saxophonist debuts in grand style alongside the legendary Zimbo Trio, the most enduring of the original 60s bossa-jazz trios who continue to work to this day under the leadership of Amilton Godoy and his incomparable piano style. The repertoire consists of 8 classic Brazilian ballads, a new side road in Freitas’ career trajectory. The composers include Claudio Nucci, Luiz Fernando Gonçalves, Guilherme Rondon, Maurício Zangari, Clóvis Aguiar and the legendary songwriting partnerships of Francis Hime / Ruy Guerra, Milton Nascimento / Márcio Borges, Paulo André / Ruy Barata and Dominguinhos / Anastácia. The project boasts a 22-piece orchestra conducted by two geniuses: two-time Grammy winner Ruriá Duprat and his customary elegance, and the fabulous Lua Lafaiette’s cinematic chords.